Please seek out opportunities even on vacation to talk to friends, acquaintances, and coworkers. Tell your Rose Park and Holland Christian story to someone who needs to hear it! Invite them to walk with you through the building, peek into classrooms, and chat with me. Your stories are more powerful than any other marketing tool we might employ. Thank you for telling your stories! Again I ask you, who needs to hear your story? No one else can tell your story like you can. Who needs to know who we are and what we do everyday at Rose Park? We are a mystery to way too many people, I am convinced. Tell your stories, please! Take someone on a tour with me! Introduce me so that I can tell my HCS and Rose Park story, too. Now, may you be filled with resurrection hope this sixth weekend of Lent with your families in vacation rest, recreation, and in awe-filled worship. This has been another growth, and meaning-filled week at Rose Park, partnering with you and the rest of the staff, equipping young and eager minds, nurturing soft and tender hearts, to transform the world for our Lord and Savior, Jesus Christ. The staff and I are eager to see your children again after vacation, to love them and learn along with them! Thank You Parent Board and Parents! Thank you to our amazing Parent Team and all the generous parents who thoughtfully organized and provided such delicious meals for the teachers during this conference week leading up to Spring Break. Your support is appreciated and meals were enjoyed by all. We are grateful. We appreciate families being on top of their hot lunch balances! We submit low lunch balance emails twice a week. If you have not gotten an email notice and your child takes hot lunch, perhaps we don’t have your current email. Please email slambers@hollandchristian.org and she can update your emails. To find out what your child’s current lunch balance is and also what choices they are making–(high school,only) please go to sendmoneytoschool.com . This is a free service that allows you to see your child’s balance. You will need your student’s ID #. If you do not have this number, you may contact the Rose Park office. There are two options for you to fund your child’s lunch account: You may pay online with a credit card at this site (there is a minimal service charge), or you may pay by check or cash in the Rose Park office. Lunch balances at the end of the year roll over to the next school year. We do not refund lunch balances. If you have a graduating senior we do transfer balances to siblings. Thank you for participating in our lunch program. We enjoy serving your children each day. We have quite a large collection of items on our lost and found tables. If you have a moment either during drop off or pick, or during parent teacher conferences, please check this table for your missing belongings. All items left on Thursday March 29 will be donated to Ditto. Thank you! The 2017-2018 tuition grant application are available at www.factstuitionaid.com. Paper applications are available upon request at the Administration Office. Applications are due by Friday, April 13. If you have questions regarding the application process, contact Terry VanDerKolk at (616) 820-2807 or tvanderkolk@hollandchristian.org. The Rose Park Transportation site is updated with the 2018-19 bus registration form from West Ottawa. The bus route rates will be changing soon and those numbers haven’t been increased yet on the website but the form is ready to be used. We have loved getting to know fellow moms of preschoolers! Our next scheduled morning is Thursday, April 12 after morning drop-off in the small gym. Please join us! Grab a cup of coffee and meet other moms of preschoolers. Younger siblings are welcome to attend. We cannot wait for the Rose Park Preschool – 4th grade spring program! The students and Mrs. Reitman have been working hard preparing a beautiful night of music. Now would be a great time to search those closets at home for the fall Walk A Thon t-shirts. The students will wear these shirts for our program. Our program will be held at Christ Memorial Church at 7:00PM on Tuesday, April 17. Parents, Grandparents and friends! Please join our 5th and 6th grade students in glorifying our Creator and celebrating their role as His image bearer. Tuesday, April 24 from 6:30pm-8:00pm we will celebrate our 5th and 6th Grade Fine Arts Night. 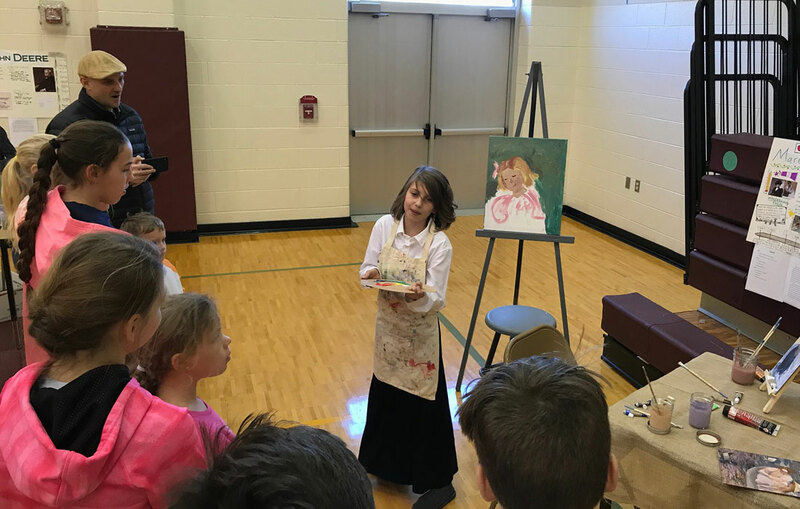 Students will present poetry interpretations, living wax museum presentations, musical solos and ensembles, and their beautiful artwork will be displayed throughout our hallways. A recess duty sign up is available on line for the last quarter of the school year. The sign up availability changes often. Feel free to check it to see if there are days that could work in your schedule. We greatly appreciate your assistant on our playground! The time commitment is 12:10-12:50. Younger siblings are welcome to come and play as well! That sign up can be found here. Physicals will be given Tuesday, April 17 from 6:30-9:00 PM at South Washington Family Medicine (Lakeshore Health Partners, 904 Washington Ave., #210) for the nominal fee of $15. For a simple and quick appointment, please click on this link. The 2018-2019 physical forms are also available through this this link. The 2018-2019 physical forms are also available through this link. MOMS IN PRAYER- All Moms are welcome to join in prayer on Friday mornings in the library from 8:15-9:05. We offer God our Praise, Confession (silent), Thanksgiving and Intercession (requests). Childcare is also available if needed. Come and receive the gift of placing your student(s) in His hands! You are invited to join the Holland Christian School Orchestras in the Jack H. Miller Center for the Musical Arts on Tuesday, May 15 at 7:00 p.m. This concert will feature a musical variety including Brahms, Beauty and the Beast, and a premier of a new compositions by senior Andrew Gretzinger. See the wonderful progression from 4th to high school orchestras, a beautiful picture of education at Holland Christian. Mark your calendars for Friday, April 13!! Peachwave will be celebrating their 5th Anniversary. To celebrate, they will have a School Spirit Day. On this day, customers can specify the school of their choice, and then 15% of their order will go to that school. For more information, see the attached flyer. Golf Lessons are available for students ages 7-17 in Holland through The First Tee, a non-profit that teaches golf and values to ANY child regardless of family income. Sign up HERE for sessions at Macatawa Legends or Winding Creek. Classes begin April 20, so register soon! Many classes at Rose Park have the opportunity throughout the school year to experience DeGraaf Nature Center. Did you know Degraaf provides several opportunities for children to learn and explore during the summer? Click here to see details of what they offer. Calvin College offers a variety of awesome summer camps from chemistry, to music, to sports. Click here to see what they offer and how to register. 2018 Grace Adventures Summer Camp brochures are available in the Rose Park Office. Please click here for more information. Spend your summer at Harbor Humane Society, empowering patience and empathy for all creatures. Brochures are available in the Rose Park Office. Or, you may click here for more information.